I can't believe I have not written about or even mentioned this yet...the Kong... is.... AWESOME! Just a short post to share with anyone out there that doesn't have one, especially if you have a chewing puppy or a dog who can be pesty around company. And yes, it's that good! As you can see, they come in various sizes, and a few colors. You purchase the size that would correlate to the size of your dog. There are even small puppy Kongs for babies. Then the work is over. You fill the Kong with treats for your dog and they have to "work" to get everything out. They are virtually indestructible and my guys work for and hour or two on just one, depending on what I fill it with. Possible fillers are their own dog food, treats or the pre-made "Kong Filler" in a can. We even fill ours, sometimes add a little peanut butter and pop it in the freezer for a cool treat. HIGHLY RECOMMEND! We just LUVS our Kongs! Mom stuffs dem wif all sorts of good stuff when her has to leave us. Thanks for stoppin' by our bloggie too! 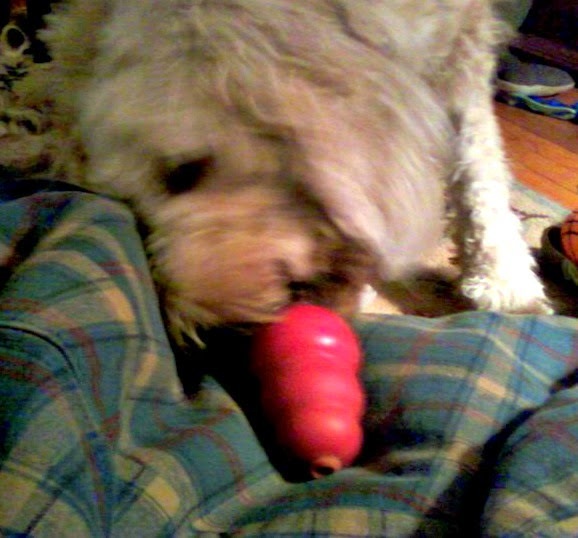 Ella ate most of a puppy Kong, so if you have a serious chewer, get one of the industrial strength ones. Ella loves her pink ones!